Developer: Hasbro Interactive, Inc., Runecraft Ltd. 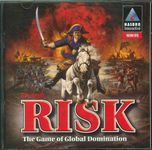 The classic military strategy game of World Conquest - now with all the excitement of a video game. You're the General, so defend your countries, capture new territories, occupy vast continents...and keep building your armies so you can conquer the world! FAST SETUP...Touch one button, and the computer deploys your troops. COMPUTER INTELLIGENCE...Battle your friends or the artificial intelligence of 6 computer "enemies." ARCADE COMPETITION...where your skill determines the outcome of the attack! BATTLE SOUND EFFECTS AND MUSIC...bring the battlefield to life!